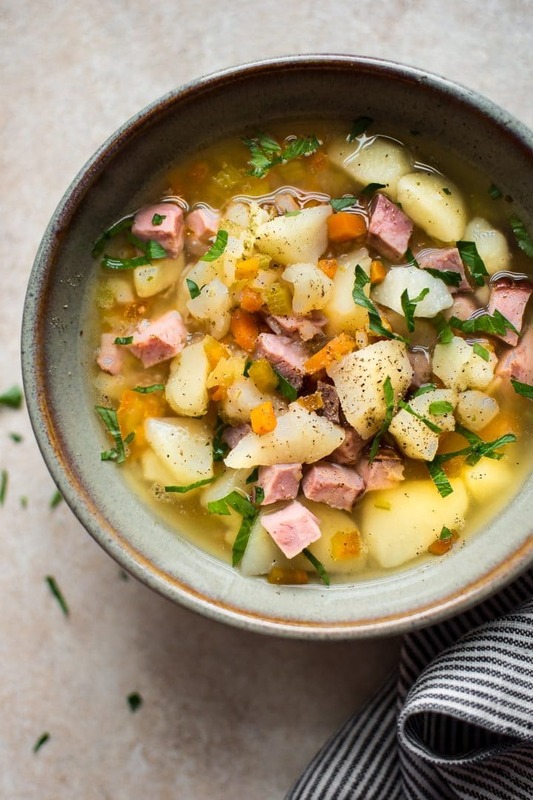 This slow cooker ham and potato soup recipe is easy, healthy, and comforting. It’s a delicious set it and forget it Crockpot soup recipe for fall! The two soups are very close in method and taste, but this one is handy for those who don’t own an IP, and it does make a slightly larger batch. 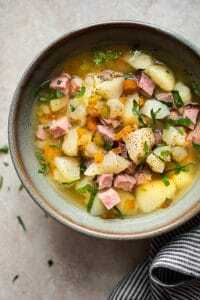 This easy ham and potato soup recipe is one of my favorites. It’s healthy, hearty, simple, and warms your tummy. As we head into crisper days, a soup like this is definitely what’s needed. I also have more soup recipes with ham on my blog if you’re interested – this ham and white bean soup and my pickle soup with smoked ham. Making ham soup in a slow cooker is basically all prep, and then you’re good. 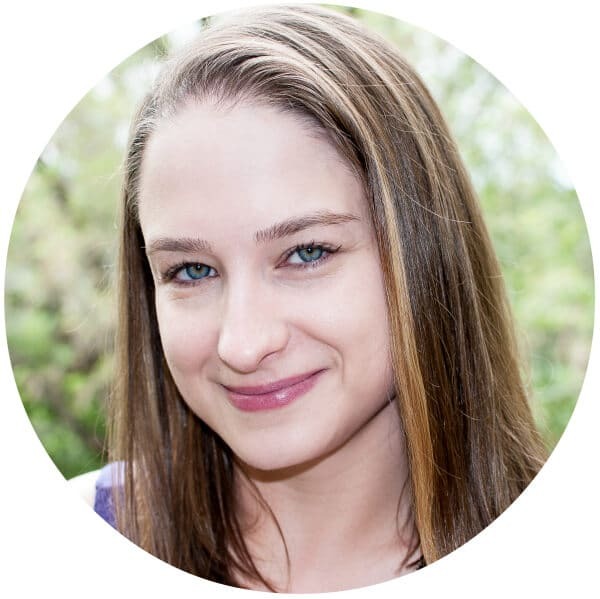 It takes me about 20 minutes to get everything chopped and ready – not bad. You then slow cook it for 8 hours or until the potatoes are nice and tender. I like to mash some of the potatoes to thicken the broth a bit, but that step is optional. I bought a piece of hickory smoked ham from my local grocery store for this soup, but you could also use leftover ham from Easter or Christmas (or whenever). This is definitely one tasty soup from leftover ham. 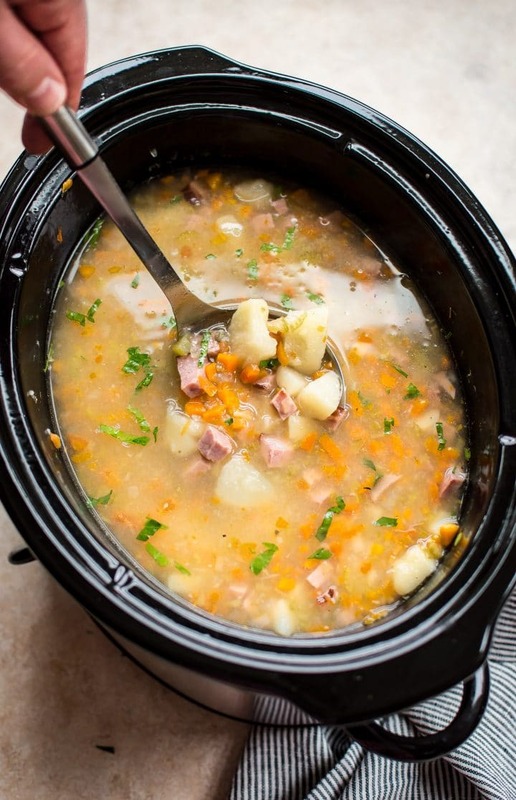 Hope you’ll give this Crockpot ham and potato soup recipe a try! 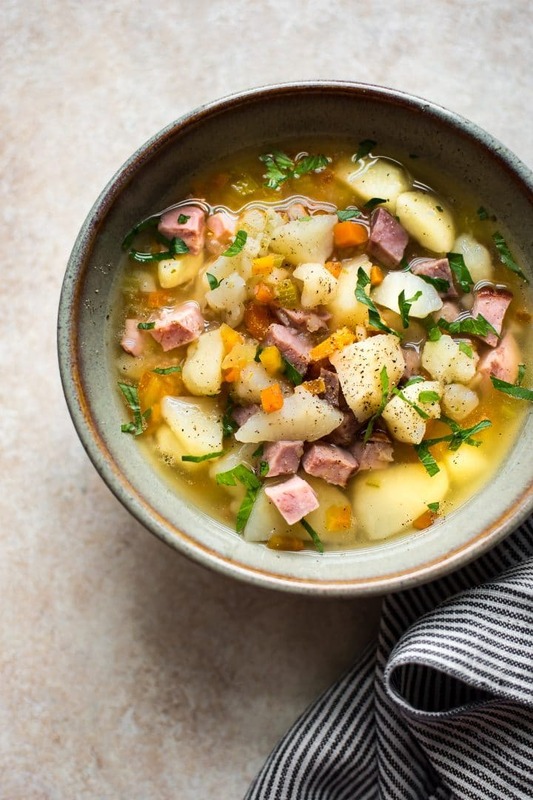 This slow cooker ham and potato soup recipe is easy, healthy, and comforting. It's a delicious set it and forget it Crockpot soup recipe for fall! Prep your ingredients and add them all to your Crockpot. I cook this soup on low for 8 hours. Depending on how large your potato and carrot pieces are, you may be able to cook it for a bit less. I like to cook the potatoes until they're very soft. Using a potato masher, lightly mash some of the potatoes right in the slow cooker. I like a mix of potato pieces and a bit of mash. Season with salt & pepper as needed and serve immediately. This soup makes great leftovers. This is the 7-quart Crockpot I used to make this recipe. Want to make this in your Instant Pot? Here's the Instant Pot version of this soup instead.